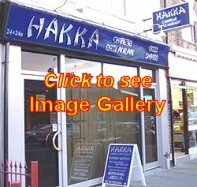 Welcome to HAKKA - A unique treat for all lovers of Chinese cuisine. From the Spice Islands to the food streets of Beijing and the finest ocean catch. We take the finest ingredients and bring Chinatown to your doorstep. You will not find some of our dishes elsewhere. The world is my oyster. Thus, we're unique. Copyright (c) 2010. Hakka Restaurante. All rights reserved.